A curious thing happened the other day: my daughter refused to bring McDonald’s to school for lunch. So not cool, mom. The negative stigma associated with fast food has trickled down to today’s youth. I was one part proud, one part annoyed. Since I’m writing this on the heels of admitting my Honey Nut Cheerio addiction, I hasten to tell you we very rarely eat McDonald’s, but it happens to be conveniently located next door to my dentist. The superstar mother I am managed to get all three of my children in for their 8 am cleaning appointments, minus their lunches. I fell from glory when I couldn’t convince my child to walk into class wielding a golden arch emblazoned bag. Put it in your lunch kit for heaven’s sake – no one will be any the wiser! No dice. The smell, she said, would surely tip them off. Interestingly, we had this conversation over muffins and juice inside McDonald’s – breakfast was also sacrificed to arrive at that early appointment (fine, so I was more drill sergeant than super mother). She has no trouble eating the food, she just didn’t want to be seen eating the food by anyone she knew. My other two children could not believe what had just come out of their mother’s mouth – they were being offered the jackpot of all lunches, would be the envy of their classmates. I couldn’t go back on this offer. In the same way I refuse to be a short order cook when they all don’t like the dinner I’m serving, I wouldn’t be running to different restaurants for their lunch that day. It was McDonald’s or nothing. I was in a position I never dreamed of: singing the praises of the fast food chain that in previous conversations I had proclaimed as evil, trying to cajole her into a quick and easy lunch. My words were coming back to haunt me, I had been too convincing in my earlier life, when I had more time for nutrition. Other kids get Whole Foods, and I get McDonald’s? The high water mark for lunches is now the over-priced organic grocery store, incidentally. While undeniably full of healthier options, Whole Foods was not at my disposal. We settled on a fruit and yogurt parfait and a couple of biscuits with jam, taken out of their packaging and disguised by her lunch kit. Hardly a lunch of champions, but under the rushed circumstances it would suffice. Another day, another life lesson: be careful what you wish for. This is really funny, Deanna! How old in your daughter? I wonder if this disdain for the Golden Arches is something happening on a larger scale among kids, and I’m curious to know if this is kicking in with a certain aged child. Really, really fascinating. I think this might make for an interesting magazine piece if you did more research! Thanks Kathy – my daughter is eleven going on twenty. It is fascinating to me, considering McDonald’s was the highlight of my dining experiences as a child. A good trend overall, but if she could choose other times to be high and mighty I would so appreciate it! I love it! 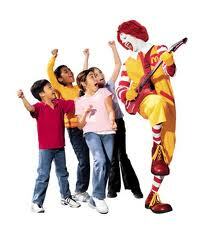 I wish my kids would stop liking McDonalds! Or ideally, if they could all agree on something!